Jim and Carole Mounier at Weibring Golf Club on October 24, 2014. Jim ’74 and Carole (Czerniak) Mounier ’75 have always been part of the Redbird family, but for 30 years they were more like long-lost relatives. They met through Greek life as students at Illinois State, left Normal after graduation to start their lives and careers—and never really looked back. It wasn’t until 2006 that they reconnected with ISU, deciding on a whim to attend an alumni event in Rockford. In the eight years since, the Mouniers’ passion for giving has led to big things for Redbird Athletics, including a new scholarship for student-athletes and construction of the Jim and Carole Mounier Golf Training Center. Now their reunion with Illinois State has led to something even bigger—an eight-figure planned gift that’s the largest single-gift commitment in ISU history. Jim and Carole both came to ISU as transfer students, their social lives dominated by Jim’s fraternity (Sigma Nu) and Carole’s sorority (Delta Zeta). After graduation, Jim went to work as a construction estimator and Carole as a teacher. For 10 years, they focused almost entirely on their careers. Finally in 1985, they took a breath and decided to try a new hobby—golf. Carole had never played before, and Jim was a novice. Soon it became their new passion, the center of their social circle. So when an Illinois State development officer visited the Mouniers after the 2006 event, asking if they’d be willing to support the University, they chose golf, a sport that builds character and life success after the 18th hole. 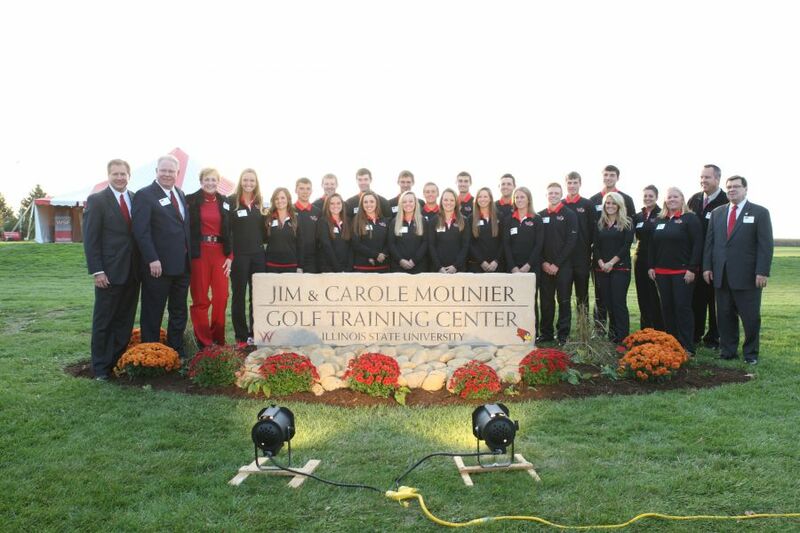 They created the Mounier Scholarship in 2007, and the golf training center opened in fall 2013. The Mouniers’ philanthropic scorecard is full. Both are longtime community volunteers who serve on the boards of various local hospitals, colleges, and agencies. Jim also serves on the Illinois State University Foundation Board of Directors, and the couple has hosted Redbird Welcome Parties for incoming freshmen from the Rockford area. 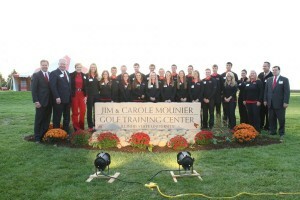 Illinois State golfers join the Mouniers for the dedication of the Jim and Carole Mounier Golf Training Center at Weibring Golf Club on Friday, October 24, 2014. The impact of their gifts on the lives of students and Redbird Athletics gives them “that warm fuzzy feeling on the inside,” Jim said. But it’s the way they’ve been treated by the extended Redbird family that’s inspired them to give back again and again. Whether it’s tailgating outside Hancock Stadium or making a road trip to the Missouri Valley Conference tournament in St. Louis, they’ve made lifelong friends. “They have made us part of a family that we had stepped away from 30 years ago,” Carole said. Illinois State President Larry Dietz honored the Mouniers during their fall visit, which included a dedication of the golf training center—one of the best facilities in collegiate golf. At the dedication of the training center, senior Redbird golfer Hayley Guyton thanked the Mouniers for impacting her ISU experience and future generations of Redbird student-athletes. The Mouniers believe in Illinois State in part because of its increased reputation in the decades since they graduated. Illinois State is now a Top 75 nationally ranked public university, among other points of pride. Visit WeisbeckerFund.com to learn more about supporting Redbird Athletics.